In November ’96 at the Rinyu Club auction for larger sized Koi, I found myself bidding as normal but the wind was howling and the temperature was freezing. Den decided to go inside the post office and watch through the windows rather than stand out there. Warm drinks were passed round but my jacket offered no protection, it was all a case of having to grin and bear it and bid for the excellent Koi passing through. An elderly guy came over with a warm coat in his hands, draped it over my shoulders, smiled and walked away. I put my arms in it, zipped it up and was warm again after a few minutes. At the end of the auction I walked inside to pay for my purchases and then went to find the guy who had brought me the warm coat. I found him alongside others who were clearing the showponds away and generally leaving the area spick and span. I was about to take off the coat but he shook his head and waved his hand beckoning Den & myself to follow him. He led us only a few yards down the slope and walked up the steps into the home that we knew belonged to Koi farm ‘Shintaro’ – I didn’t know his real name then. Once inside the living room we sat around the table and a young woman brought coffee and snacks to us whilst the elderly guy came back with a bottle of brandy and tipped a liberal measure into our coffees. After that, he smiled and rubbed his stomach to indicate that the coffee would warm us up – it did! After a few more minutes in walked Shintaro himself and we shook hands. Paper and pen can work wonders at times. He knew I had looked at his Koi on many occasions but I had never asked for prices. I explained to him that the UK market would not take kindly to his Koi as the colours looked very pale in comparison to others in the area. He asked if we would return the next day as the light had already gone and he would show us his stocks in daylight. 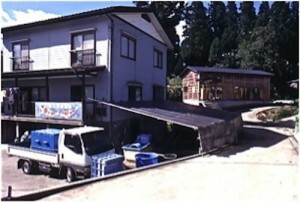 This was the Shintaro facility taken in 1996. We returned the next morning and followed him into his only indoor Koi house at that time, which was situated to the side and rear of the dwelling house. There were four ponds in there that were just over two meters deep. Heavy aeration was being used and the Koi were hard to distinguish as the water held a yellow/brown tinge to it. We had already gathered that the elderly guy was Shintaro’s father, the lady was Shintaro’s wife and we watched as the three of them busied themselves with bowls, nets and cleared an area where we could view the Koi below us. It was only when the aeration stopped that we could begin to see the outlines of the Koi in the ponds and I do recall Den and I kneeling down and grasping the edge of the pond to get a much closer view of them before realizing that every variety of Koi imaginable was there, providing, of course you only wished to see Go-Sanke! When the Koi were placed into bowls for the first time, then they took on another dimension that was hard to take in at first. I can’t recall if it was the ‘skin shine’ or the soft orange beni or the cigar skeleton that hit me first but, whatever it was, these Koi were truly delightful. 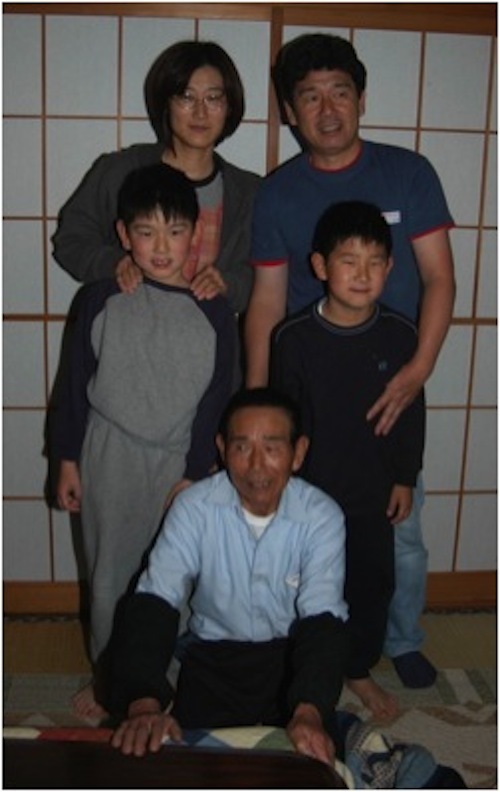 Here’s an example of a typical Shintaro Sanke but the man behind it all was Toshio! That day was to be the start of a long relationship with Masaru Saito, his wife Hiromi and his father, the wonderful Shousuke and although I didn’t know at the time, I had finally found myself another teacher! Autumn ’97, two years after Koi Kichi had been published, was the start of what would turn out to become known a year later as ‘Pe-tah san’s Convoy’ by several breeders. I never once advertised that we took enthusiasts to Japan to find Koi but the requests kept coming in from various countries. 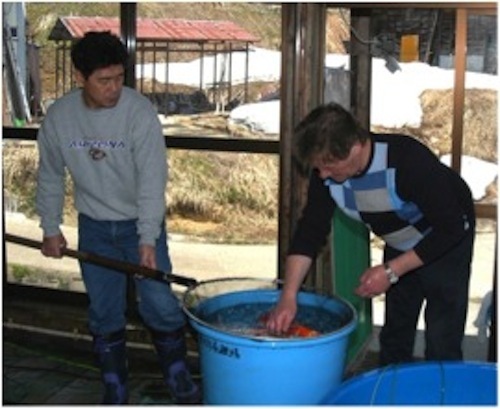 Whereas Koi dealers are very well aware of all the risks involved in buying and shipping Koi and accept it without question, the vast majority of enthusiasts do not – especially those traveling there for the first time. In view of this it had to be explained to them in detail and accepted by them before I would, in turn, accept them. As we know ‘Live Stock’ can become ‘Dead Stock’ and Koi are far more difficult and risky to transport across half the planet than creatures that do not live in water. I had to make sure that these guests, most of whom I had never met in my life, signed and returned the forms sent out to them. In autumn ’97 the first party to come over were from the UK and several had been with me before; we all stayed in the Grand Hotel in Nagaoka. 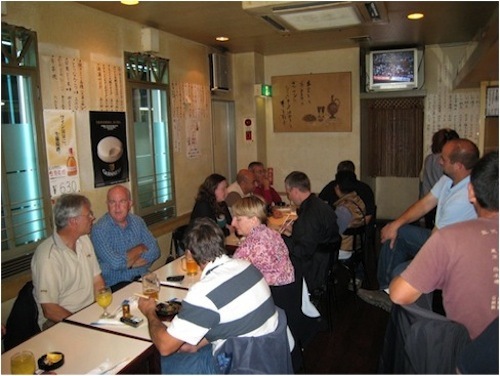 In 1990 after many years of checking out all the bars in Nagaoka I finally found a cosy one that prepared wonderful food and drinks at a good price and the guy that owned it (Mr. Goi!) spoke excellent English. Another advantage is that it is situated very close to the Grand hotel. ‘Nomole’ the ‘Koi bar’ in Nagaoka. The bar in question is ‘Nomole’ which translates roughly as ‘Let’s Drink’; by 1996 it was better known by the name of ‘The Koi Bar’. Anyway, on the first night after the UK guys arrived we found ourselves back at Nomole when I mentioned that the first stop the next day would be to a ‘secret breeder’ they had never visited before and the next morning we took them to Shintaro where his freshly-harvested stocks were all on display in superb condition. I think we were there for over four hours before leaving for other breeders. That night back in Nomole I asked the guys where they wished to go the next day and, to a man, they all shouted out – ‘Shintaro’! We returned the next day when the party bought many excellent Shintaro Koi and Masaru was more surprised and delighted than anyone. It was the first time he’d sold his Koi to overseas collectors – but that was only the tip of the iceberg! In truth it is almost impossible to differentiate between tategoi from Shintaro, Yamamatsu and Toshio simply because all bear the Toshio hallmarks. The ‘Shintaro’ Family. Hiromi and Masaru Saito rear. Sons Kensuke and Kosuke. Shousuke Saito kneeling. In later days on the same visit, there were guys from the USA who joined us and it was also the very first time that Hilary came to Japan. It was one of the USA guys who started up something funny that continued forever. He’d emailed before he arrived that he would appreciate an advance itinerary to cover all the seven days he’d be spending there. I replied by saying this would be presented to him on a daily basis every morning and left it at that. As expected, the guy in question joined us for breakfast and brought up the subject of his day’s itinerary. I looked surprised and asked Dennis – ‘You posted one under his door early this morning didn’t you Den’? Den, already in on the game, as were the rest of the guys, came back with ‘Room 753? Yes, I distinctly remember slipping it under the door on the way to room 761.’ The other guys all confirmed they had theirs and knew exactly where and when we were all going that day. I suggested to the guy he’d overlooked it, but not to worry, we’d make sure he’d get another for the following day. I’d come back with a modest reply such as ‘Sheer professionalism as a result of many years of hard-earned experience’ or some other similar nonsense! There were some trips where we’d actually slip a nonsense itinerary under someone’s door knowing that he’d bring it along with him the next day. I’d come up with the usual – ‘Well done Den, Hasegawa 9.13, perfect’! 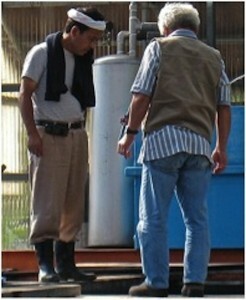 Next a voice from the back would say – ‘It says on here that first stop is at 9.39 at Hosokai’! There was never, ever an itinerary produced but we had some mileage out of it over the years! Another one for the first timers was when I’d attempt to do my ‘Official Tour Guide Thing’ but would prime the others first and the first timer would be totally convinced that this was how the trip would be. Everytime these words were mentioned there would be a lone voice from the back asking – ‘What’s he just said now’? I needed a handkerchief at times to pretend I was sneezing when, in truth, I was creased with laughter! Hil joined us in Isawa after making her very first long-haul flight and the Isawa Nishikigoi Center is not the easiest of places to find from Narita airport as three train journeys are necessary with a short taxi ride after that. She made it all the way to Isawa Onsen station without a single hitch; it was only the taxi ride that proved to be the problem. Toshio’s wife received a phone call from the Haibara farm to say an English-speaking lady was looking for the Isawa Nishikigoi Center but had arrived there instead. A word about Hilary here, she’s been involved in Koi on a full-time basis since 1982, she’s handled more Koi than most guys I know and she’s a dab hand at using a microscope, identifying parasites and knowing what to use to eradicate them. Despite all of this, I do wish I had taken a picture of her face when she saw her very first Koi in Japan – Toshio’s very best! That was the only time I’ve ever seen her speechless – worse luck. That night I knew I had a problem to face as we were all booked into the Sun Plaza and Hil was with me this time. I had often mentioned this lady I fancied in Japan but had never revealed my pet name for her. Much worse, Bagpuss had picked up a few more words than her standard ‘NO’. My heart sank to see her stone-faced behind the reception desk as we all approached. She looked at me, then looked at Hil and then at the book in order to confirm to herself I had reserved a double room. She half-attempted a half smile but failed miserably and then out came the words – ‘Oh, you have a Honey’ as she handed me the keys. As we entered the room, Hil asked – ‘Was that the one you fancy’? Of course I played on this throughout the night at dinner with Toshio. I’d primed some of the guys to keep mentioning how stunning Bagpuss was, as I watched Hil listen to them with a puzzled look on her face. By then Toshio had totally accepted the fact that overseas customers would be vital to his future business and had picked up a few more English words than before. He had many overseas lectures under his belt and his stature with the other Japanese breeders placed him on a much higher pedestal than a few years before. His earlier traces of shyness had almost been conquered and he’d become much more of a personality as well as a wow with many of the foreign lady customers. In short, he was getting to be a bit of a charmer and some of his sales techniques were nothing short of stunning! He’d also found a new pastime in gambling on the horses, much to his wife’s total disapproval. ‘Eye yam a horse race Challenger – gapo-gapo-gapo’ as his wife shook her head to indicate he was really a horse race loser! I think it was also on that trip, or the one before? I first heard him mention ‘My Clean Water System – gapo-gapo’! I honestly cannot remember which visit it was but it was around this time period. Den and I turned up one day with our guests and amongst them was a couple in their mid-50’s. As we climbed out of the vehicle Toshio came over towards us, stopped some 20 feet distant, smiled and then bowed. I don’t think he’d ever seen any of our guests before but his eyes were rapidly analysing each one as he beamed his welcome smile. A few seconds was all he needed to do this in order to estimate whether one person needed cheap Koi and if another needed serious Koi. His estimations rarely failed with the parties I took down. One guy even mentioned to me – ‘That guy knows exactly how much money I have in my pocket’! Back to the visit in question. He started out by having his guys set up some small blue bowls before his main ponds and went over to a pond that contained tosai around 9” long. He pointed out several of these to his staff who caught them and placed them into the bowls that Toshio wished them to be placed. ‘My tategoi’ – said he, followed with ‘teaching time’! One by one, the Koi were returned to the pond and, some 30 minutes later, he was left with one Koi only – an exquisite Kohaku. ‘Ichiban tosai tategoi – gapo-gapo’ said he proudly. No doubt it was an amazing thing. The lady whispered in her husband’s ear and he came over to me. ‘How much is that Kohaku Peter’? I asked to get the reply – ‘No sale, my tategoi- gapo-gapo’ and the Koi was returned to the pond. Some purchases were made and then it was lunchtime at the Blue Bird. Throughout lunch the husband asked me again and again to buy the Kohaku that his wife needed so badly. I waited until we returned and took Toshio to the pond, pointed to the Kohaku and mentioned that the guy wished to buy it for his wife as a special present and money wasn’t really an issue. In minutes the Kohaku was back in the bowl and Toshio was studying it closely, at the same time the lady was at the point of…..well you know, it’s not the time or the place. At the perfect moment Toshio stood up, looked at the guy, pointed to his wife who was melting by then and asked ‘Present Oku san’? The guy confirmed he wished to buy it as a present for his wife. Toshio then replied ‘No gapo-gapo’ a then pulled a face of sadness and total disappointment before he added ‘My present – Oku san’ and gave it her for free before walking away. I had to explain to all of them that he had given the lady his very best tosai for free and it took some time to sink in. After it has sunk in with the couple, I watched the two of them go to the main ponds where they bought some of the finest Koi he owned.